Paper folding is a traditional and popular Chinese craft. 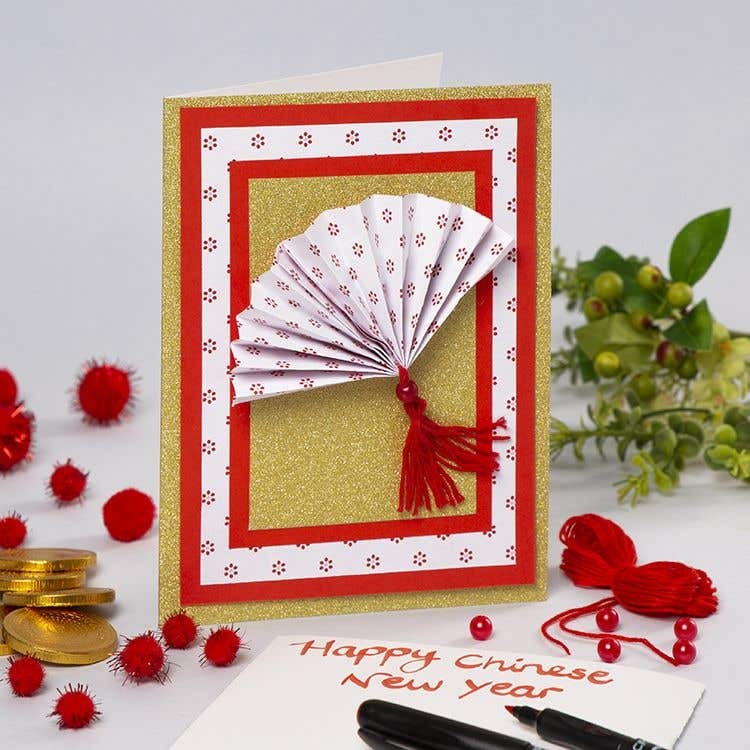 This miniature version of a paper fan makes a decorative addition to a New Year card. 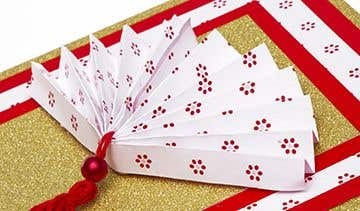 To make a folded fan, cut a rectangle 12cm x 17cm from patterned paper (a quarter from a Spring Patterned sheet). Place the paper flat onto your work surface or on a cutting mat, positioned with one of the short edges at the bottom (portrait). Fold up the edge of the paper 1cm then make a crease all the way across. Turn the paper over and make a fold in the opposite direction. Continue to fold the paper all the way up to make a concertina, turning the paper over after each fold, with each fold approximately the same depth. Fold the concertina in half to make a ‘V’ shape. To make a tassel for the fan, start by holding 3 fingers together. Wrap embroidery thread around your fingers 10-15 times to make a series of loops. Carefully slide the loops off your fingers and tie a 30cm piece of thread on one side to hold the strands together, leaving the long ends for fixing the tassel onto the fan. Cut across the loops at the bottom and tie another piece near the top to make a bobble shape. 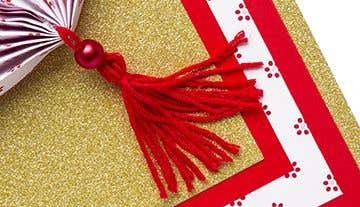 Trim the ends of the tassel into a neat shape. Thread a bead at top of the tassel then tie the ends of the thread around the middle of the folded paper. Lightly brush glue along the folded edges in the middle of the fan, then press together and leave to dry. Open out the folds into a fan shape. Fold piece of glitter card in half then trim off the ends and sides to make a background measuring 14cm x 18cm. 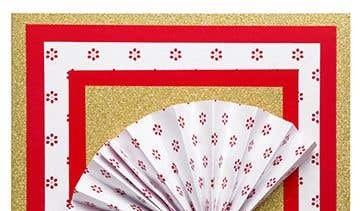 Cut several rectangles in different sizes from red, gold, or patterned paper and stick them in a stack onto the background with double-sided tape.to create a layered effect. Lightly brush glue over the folds on the back of the fan then press it in position onto the background and leave to dry. To make the layers for background, cut a rectangle 8cm x 12 for in the middle, then make the rectangles underneath progressively bigger; 9xm x 13cm, 11cm x 15cm, 12cm x 16cm.